In early January, students in Harrisburg University’s Applied Geographic Information Systems (GIS) class were notified of the course requirement for a semester long applied GIS project. This course builds on the freshman year Introduction to GIS class and encourages students to explore unique and practical ways to apply GIS technology. Students at this level in the Geospatial Technology program are encouraged to find opportunities to collaborate with outside organizations that could benefit from their work. A mapping component to Digital Harrisburg rose to the top of this list of collaborative projects. 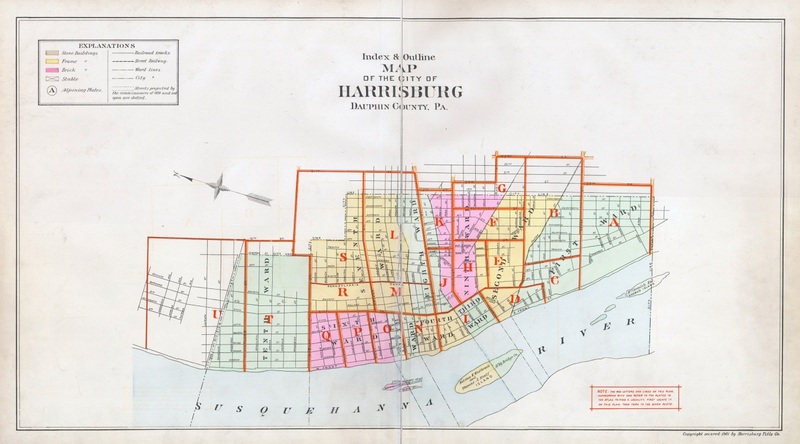 Two Harrisburg University Geospatial Technology students volunteered to work with Messiah College to create the base map of turn of the 20th century Harrisburg for 1900 US Census data to be displayed within. The following base map development and census data mapping methodology was applied to the project. The Messiah College Digital History Professor David Pettegrew conducted the research into available maps of the late 1800’s to early 1900’s. 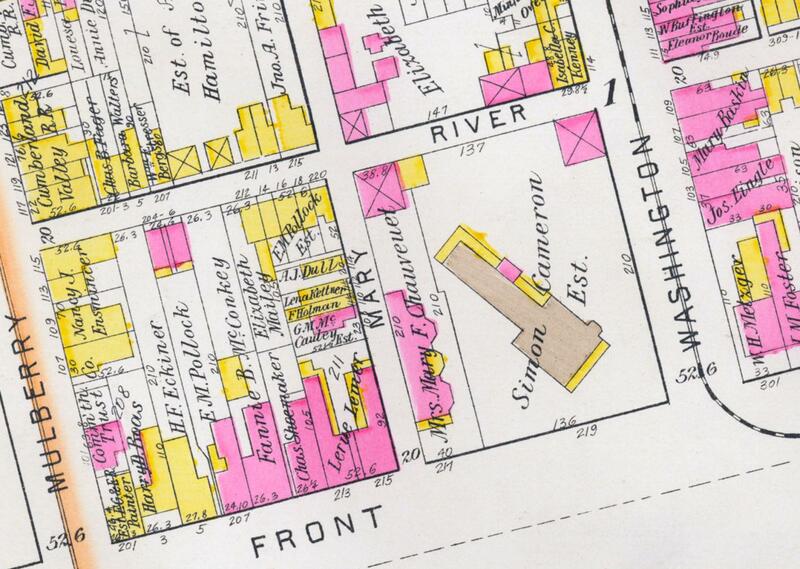 After review of various sources, including several series of Sanborn Fire Insurance Maps, the 1901 Atlas was generously provided by the Dauphin County Historical Society. This atlas was compiled from plans, deeds, and surveys and published by the Harrisburg Title Company. The historical society already had archived digital raster images of the atlas index plate (figure 1) as well as 21 individual map plates (figure 2) spanning the extent of the city at that time. These files were shared with HU students via a Dropbox folder. Details such as building/property owner names, property frontage dimensions and addresses were included in the detailed plates. The average file size for the high resolution images was 6 to 10 Megabytes. A compiled spreadsheet containing all census records and attributes was also provided from Messiah College by the Digital History students. The 21 individual atlas map plates were divided between two HU students to be georeferenced to the current 2014 Dauphin County Street network which was provided by the Dauphin County GIS Department. The georeferencing process required the students to first identify the extent of the historic map plate and center the ArcGIS base map to the same location. Once centered, the students’ second task was to work with the ArcGIS Georeferencing toolbar (figure 3) to rotate, scale and shift the raster map to obtain the best alignment with the current city base map. This process primarily relied upon the city street network but aerial photos, a Susquehanna River layer and even google maps were used as additional reference information for the alignment. The third and final georeferencing process required the students to create links for coincident features between the historic raster map and the 2014 street network. These links were created from Intersections that were depicted on the 1901 atlas maps to the current street intersections. Only roads that maintained the same relative alignment between 1901 and 2014 were used for link placement. As can be seen below (figure 4) the center point of non-developed intersecting street spaces on the 1901 maps were aligned with 2014 intersections. The primary challenges to georeferencing the 1901 maps was the addition, removal and realignment of streets over the last 113 years. In many areas of the city a dramatically different street network exists today, particularly in the south end where Interstate 83 and its exit/entrance ramps have been built. 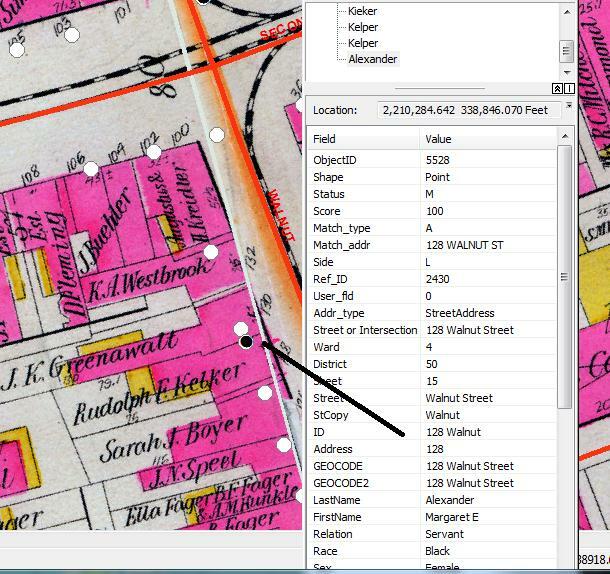 With the end goal of locating all of the 1900 city census data records by address, the 1901 street network needed to be recreated in digital form. Students began this process by first removing all 2014 street/highway centerlines that did not exist in 1901. This relatively straight forward process was completed quickly. The second step, however, required the students to digitize streets from the 1901 maps that are either no longer present, or had a radically different alignment, into a version of the 2014 street network. Figure 5 depicts a region of the city where the street network has changed. During this process the students also updated the 2014 street attribute table to include address ranges from 1901 for both left and right sides of streets. Figure 6 depicts the street attribute table and address range details. NOTE: This digitizing process is currently underway. The results of all incremental geocoding steps will be reconciled and merged into a final layer of census record locations. Initial geocoding results can be seen in figure 8 and 9. It should also be noted that a significant number of the digital census data records were either not located or mis-located due to missing or incomplete address data. 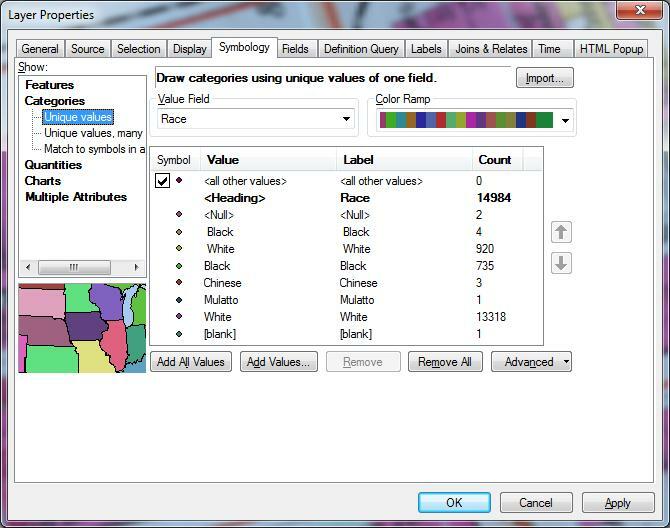 Using ArcGIS’s Layer Property Symbology editor, students are able to select attribute-based categories to symbolize each census record. Figure 9 depicts the ArcGIS Interface for editing symbology. By selecting the attribute field that contains values for visualization, users are able to specify unique symbols for each unique or categorized value. Figure 10 shows unique point symbology for race in the first block of Walnut Street. It is important to note that the census records relate to individuals so in most cases multiple individuals who live at the same address have points stacked directly on top of each other. Using GIS, each unique address can be given a count value for the number of individuals residing at that address and the count can then be used to create point symbols of graduated sizes based upon number of residents. 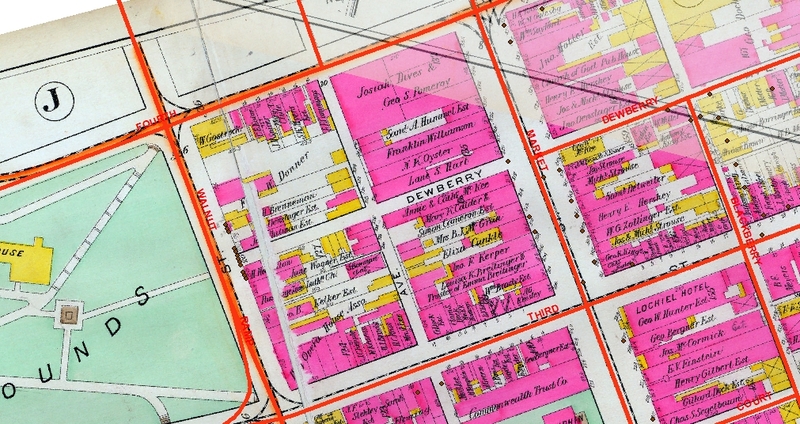 The geocoded Census data provided a realistic visualization of the demographic distribution in 1900 Harrisburg but the exact placement of these geocoded records, while placed within the correct city blocks, are not always aligned with the correct property boundary and/or building footprints. 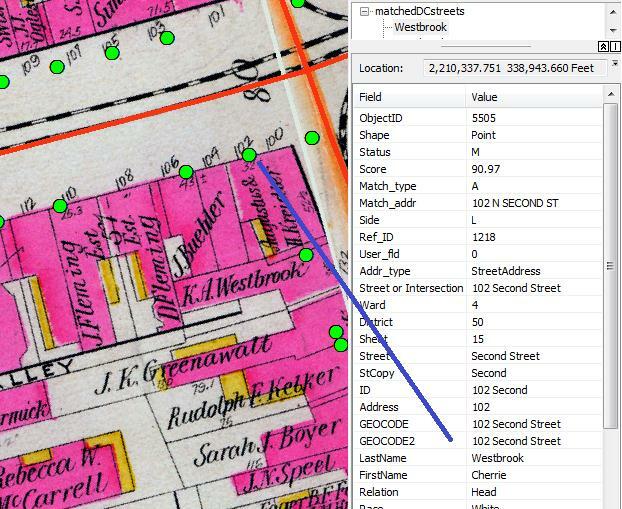 A significant effort is still required to physically move the location of these geocoded records into the extents the 1901 properties/buildings. One HU Geospatial Technology program student has indicated an interest in continuing this project during his Junior year. 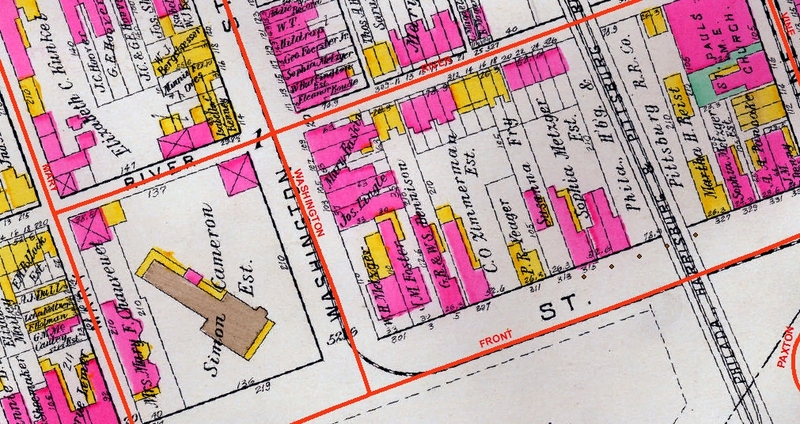 Undoubtedly many of the building extents have changed over the years but properly locating these records to the 1901 buildings will very likely allow the vast majority of them to be spatially linked to the current property extents, thereby establishing a baseline for future census data to be more accurately geocoded and compared to current demographics. Now that the 1900 census data records have initial locations relative to city blocks, and the potential to be accurately aligned with property boundaries, many different historic visualizations are possible. Using GIS display capabilities combined with the census record attributes, interested historians can peer into the details, density, and distribution of historic demographic factors such as race, ethnicity, literacy, and occupation. A completed digitization of the 1900 census and subsequent census years can be processed by students in a similar manner. These future GIS datasets will allow trend analysis to be performed in GIS shedding further light onto the demographic dynamics of Harrisburg.